Nessie Vinylin is a deep-action cleaning agent for all electric record-cleaning machines- Powerful against dirt – extremly gentle to your records. Nessie Vinylin is a ready for use product, no mixing is necessary. One 500 ml bootle is suitable for approx. 100 LP-records. Nessie Vinylin® is perfectly matched to the Nessie Vinylmaster® record-cleaning machine, but also a upgrade for other Record Cleaning Machines. Nessie Vinylin® removes contaminations quickly and bonds them with so-called complexing agents. The record is cleaned down to the bottom of the grooves and the shiny black surface is restored. The cleaning agent is free from aggressive substances and 100 % compatible to the surface of records. Nessie Vinylin® is not hazardous in the sense of the currently applicable EC directive and requires no special declaration. 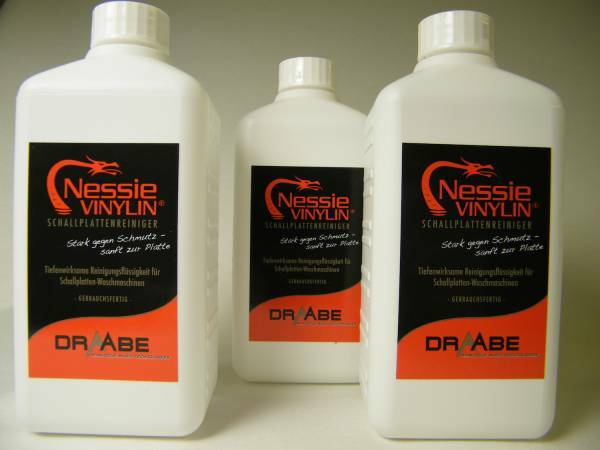 Related links to "Nessie Vinylin Record Cleaner 500ml"
Customer evaluation for "Nessie Vinylin Record Cleaner 500ml"